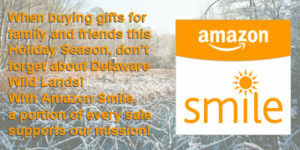 Planned gifts allow you to support Delaware Wild Lands now and into the future while meeting other important financial, family, or personal needs and goals such as generating annual income payments, caring for aging relatives, reducing tax obligations, donating land assets with retained living and/or use rights, and protecting real estate and financial assets. Information provided here is intended to offer creative opportunities for you to advance conservation in the First State by including Delaware Wild Lands in your financial and estate plans. We strongly recommend you consult with your tax advisor, as tax laws and regulations change frequently. If we can provide you or your advisors with information or assistance, please contact the Delaware Wild Lands’ office at (302) 378-2736. In your will, you can leave to Delaware Wild Lands a specified dollar amount or percentage of your estate or a specific asset within your estate. This provides you with full control and benefit of your estate and assets during your lifetime and the satisfaction of making a meaningful and long-term contribution to land conservation in Delaware. If you wish to make a provision in your will, please consult an estate planning professional as each state’s rules and regulations vary. We offer you the following language as an example. Trusts are a collection of assets that provide a stream of income. An organization and/or individuals can be designated as the beneficiary of the trust or the income generated from the trust assets. Alternatively, the income from the trust can be designed for one or more individuals and the trust assets designated to Delaware Wild Lands. This mechanism allows you to make a gift to Delaware Wild Lands now while retaining income from secure, fixed payments for life. A portion of the payments may be tax-free or help you qualify for charitable income tax deductions. You can designate Delaware Wild Lands as the beneficiary of your corporate or personal retirement plan, life insurance policy, bank account, or brokerage account. For example, should you no longer need the full amount of your accumulated retirement funds or life insurance purchased years ago, you may consider a gift of a retirement fund or life insurance coverage to Delaware Wild Lands as a way to make a large contribution with little cost to you. Donations of appreciated stocks, bonds, and/or mutual funds to Delaware Wild Lands can be transferred directly from your brokerage account to Delaware Wild Lands and may provide you with tax advantages. As brokerage firms do not typically release names for privacy reasons, please contact us directly so that we can properly acknowledge your gift. Many employers have matching gift programs that support the interests of their employees or support community volunteer and involvement opportunities. Your human resources or personnel department can provide additional information about matching gifts. Delaware Wild Lands also welcomes hands-on involvement and can help coordinate a volunteer or corporate involvement event for employees.